There has been a lot of good stuff going on with my training and I’ll try to hit the main points. My max effort upper day this week was interesting as I am utilizing a new piece of equipment we have aquired called the shoulder saver. This pad wraps around the bench bar and provides a reduced range of motion such as that of a two board. I am focussing on making sure I pause all these reps during the cycle to practice being explosive with the bar coming off my chest. I was wanting more weight for my top set but shut it down as soon as my form started to break and left some in the tank for my upcoming heavy chest days. I have looked back through my training logs from last summer (when I made the most progress on the bench as I ever have) and will be using some of the accessory movements from those training days in my routine this coming cycle. 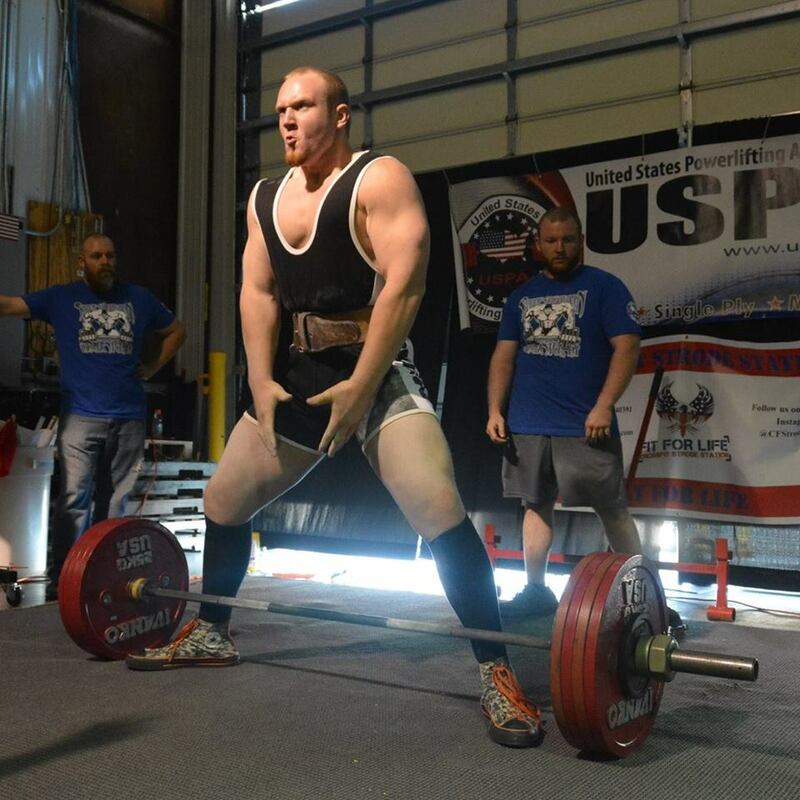 JM press is a great example of a movement which had great carryover to my competition lifts. Speed squats and deadlifts felt awesome at the end of last week. I pulled conventional because I do not yet own a pair of short average bands and can pull sumo with the longer, pro length band. Additionally, I want to start rotating my sumo and conventional pulling on speed days so that I can make sure and stay balanced. I did not know what to expect while pulling conventional but I was pleasantly surprised when I felt very fast and powerful off the floor. I rounded out the training week with my dynamic upper body day this morning. Speed work for the bench lets me build explosiveness but also gives me a lot of chances to practice getting tight, setting up correctly, and unracking the bar which are all thing I have struggled with on meet day. The close grip work that follow allowed me to thoroughly toast my triceps just to round out the day. I am very excited for the upcoming weeks of this program. My workouts seem to be going better than ever and I can tell that I am finally starting to find a great balance between training hard, recovering, and taking care of my body so I can avoid naggy injuries and train healthier and harder. The second half of this semester has been a struggle and I have had to learn a lot about balancing the various places I have invested my life. As I said, getting in the gym, letting everything go, and hitting it hard has always been my way of relaxing and cutting loose. Now more than ever in my life it is an outlet to let everything roll off my shoulders for a couple hours and focus on something I truly enjoy. Being a college student and training definitely isn’t always ideal especially when trying to set up a regular schedule. We are not on scholarship here, we do not get specific time carved out of our day to practice our craft, we do not get free passes to take exams early or get to sign up for classes ahead of anyone else. Each of us on Purdue Barbell make the time for ourselves, whether that means getting up early in the morning or staying out late at night, to get our training in and better ourselves. I am proud to call this group of exceptional students my teammates and can count on them at any given day. The old joke about having to pick two of the three places to spend time in college (social, academic, or rest) is definitely on point. I can speak for all of us when I say we have to make sacrifices in our personal lives to fit everything but that is where priorities come into play. All this being said, I have zero regrets about how I have spread myself out during college and don’t plan on changing a thing. I don’t know if it’s because I am about to become a senior or what but I have been thinking back to all the experiences that powerlifting has allowed me to have and just have to smile. I am in no way close to being done, I’m still just starting, but it has been a heck of a ride so far and it’s just going to get better from here.